Sea serpents have a bit of an identity complex. Some are scary monsters, from the depths of dark lagoons, while others are friendly and somewhat goofy. In the case of Disney, the latter is most definitely the angle they’ve pursued. From the animated Loch Ness creature, Nessie, to the peculiar serpent that once inhabited the mostly serious 20,000 Leagues Under the Sea Submarine Voyage. Then, there is this guy. Affectionately known as Brickley, he came to Walt Disney World back in 1997. 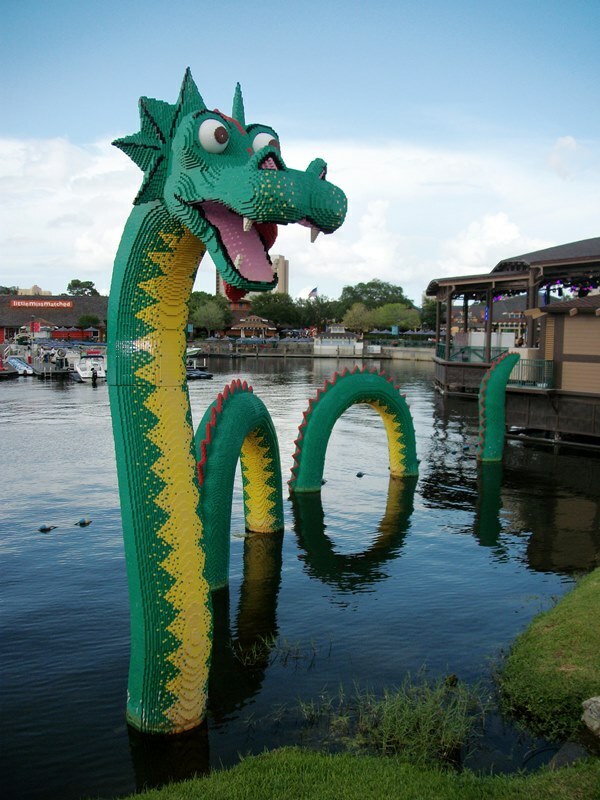 In October of that year, the LEGO Imagination Center opened in Downtown Disney and the 30 foot tall sea serpent came along for the ride. Brickley has appeared at many LEGO Stores around the world as an unofficial mascot of sorts. In some cases he works his way in and out of rooms, while other times, such as at Walt Disney World, he actually plies the waterways overlooking the store. He is comprised of over 170,000 blocks, which would make this a daunting structure for anyone to try to complete at home! Knowing that Brickley has a fervent fan-base, LEGO made a very wise decision in 2011. That year they released not one, but two sets dedicated to Brickley. The first, and smaller of the first sets, weighs in at 59 pieces and can still be found seasonally at LEGO Imagination Center in the Downtown Disney Marketplace. The larger set, comprised of 197 pieces, hasn’t been available for a while, but can still occasionally through online resources. Both feature Brickley’s watery formation of a head piece, two arches, and a tail segment. Sea serpents have a great history with Walt Disney World and Disney as a whole, but there may be no greater serpent than the one that has been built brick by brick. Brickley has been the silent sentinel of Downtown Disney for more than fifteen years, and I home that he stays for a long, long time! The WDW Brickley is about as perfect as can be. At DL, he's inside, peeking out from behind a shop wall -- not nearly as eye-popping!